I hope everyone had a great Easter!! We are finally getting sunny warmer weather here in Northern NJ. I try not to speak about my MS when I post, but this is such excitement for me I thought I would share what is going on in my life. Maybe this will even help someone else out there suffering from MS or a similar illness. The last time I went to my neurologist John and I knew we were going to be speaking to him about a new drug that has been approved by the FDA for remitting/relapsing MS. The drug has been out for a while but the doctor wanted me to wait a bit. He wanted to address it in the spring and we were going to make some decisions and I read literature about the new drug through the winter that he had given to us. My doctor is a well-known doctor in the world of MS and this is his field and nothing else. I have been on a drug name Betaseron for the last 20 years. It is a subcutaneous injectable drug for remitting/relapsing MS. When this drug first came out the only way I was able to get started was through a lottery. They didn’t have a lot available for all of the patients that needed it and my number got chosen relatively quick. Being young and very scared I decided that I had to take this drug so I started the injections. It is one of the more powerful injectables out there. It does come with drawbacks, flu-like symptoms and when I say symptoms I’m referring to low grade fever, chills, aches, weakness and feeling tired. For me, in the beginning these were very prevalent not to mention I had to inject myself every other day, I HATE needles and I mean HATE!!! Somehow at the age of 26 I mustered up the courage to do the injections. My new treatment is Tecfidera and is in pill form. I take this two times a day and there is side effects I have to get through the first month and then they dissipate. I am in my first week and things have been good. When I up to the full dosage is when things may or may not be a problem. I am trying to be positive about the side affects, wish me luck. In other news, which is HUGE, the doctor suggested I get fitted for a fiberglass brace and he said it would still allow me to wear my skinny jeans. I know; what is the big deal, right, but for me it is a big deal. I feel I have had to give up many things with MS, I don’t want to give up another thing that is important. Well look what John and I picked up today. You put in the shoe and then put your foot in and strap it around the calf. The result is astonishing for me. Many know I walk with a cane but what they don’t realize is with that comes limitations. With drop foot on my right leg I tend to slide my leg and have trouble lifting my foot when walking which comes with the danger of stumbling, falling and crossing thresholds is a big problem with tripping. Having this issue with my right leg saps 25% of my energy each day. When Audrey, who we are staying with as many of you know, and I went for the first time to try this brace we were astounded with the difference this was making, we cried. I knew John had to come with me to pick this up because I needed him to see how much things were going to change for me and for US!! When everyone was wearing cute sneakers and sandals in the summer I was wearing boots to give my ankle stability. 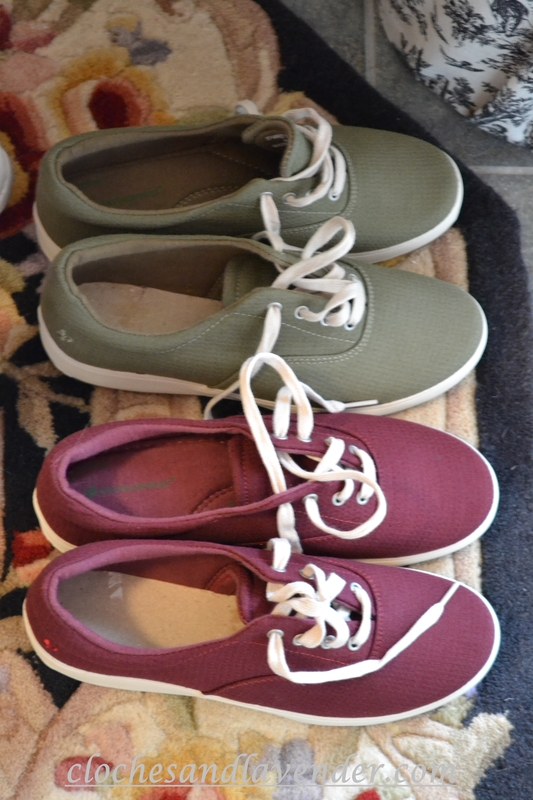 Look at what I bought today, cute little sneakers in different colors. The Orthopedic guy has one pair of my boots he is trying to stretch to fit my brace so I can wear them next fall and winter. He explained what I need to look for with the boots. Boots have become my security blanket so to speak so he totally understands why I want to have them and I want to be able to still wear them, HUGE boot girl. This means, for me, I can go back to the mall, craft fairs and the BIG news is walk with my John and Peanut and Reeses in our new neighborhood. I may not be able to do these things all day since I still may tire out but the idea to be able to do the things I LOVE again is pure HAPPINESS!! So happy for you, one crazy little fiberglass contraption can change your life! I’m sure there is a getting used to it curve, but that won’t take long and sneakers…Cute sneakers….Gets a little warm in the summer for boots! And of course you will have to let us know how the magic pill works!!! The brace will take a little getting used to and I can’t be afraid or intimidated by it. I have to realize I can walk and not stop like I usually do with fear of falling. That is great news! I’m so happy for you. I’ll be praying that all goes well with the new medicine. Thanks for the prayers Sharon. I am encouraged and I just have to get through the first month. I hope you are feeling well since the surgery. My thoughts have been with you! Wonderful news, Cynthia! I’m sure you are thrilled that this new medication will make your life easier and more enjoyable! Oh Kathy, I am happy and a bit nervous at the same time. I up my dosage tomorrow and with that may come side affects but I am praying that they aren’t anything I can handle and it is only a month. So far just flushing, which is read and itchy but at least it goes away. Thanks for being here. Oh happy day!!! What a difference this is going to make to your life. I don’t know how you do everything you do with your limitations! You are amazing! Heather my sweet friend, you have been with me from day one and I have told you before that means so much. My life, our lives, will change in many ways. I will be able to do t he things I love again, cooking, taking care of my little family, bake, shop. Go for walks with my pups which I have never done. Even laundry won’t be such a pain and NO I don’t enjoy the laundry. Simple tasks, I just have to get used to it and to t he meds and plow through. Too Happy for Words Truly!!!! Cynthia, This is better news. I’m thrilled you have some alternatives now! I’m sending prayers that this medicine will work well. My mother in law had MS and she had the same brace for her drop foot. I can only imagine how you felt at 26- so scary! Hopefully, your new medicine, brace and home will make life much easier! Oh Betsy thank you so much my friend, encouragement really helps me. This brace will change my life in so many ways and this new drug, no more needles! I just have to get through the first month with some side affects when I up the dosage. I am going to hang tough and hope I make it through and maybe I won’t even get anything too bad. Oh Cynthia, this is such great news! I know your heart must be singing with all of your new potential. I trust the new drug more than meets your expectation. So, so glad for this report!! Mary Alice this is going to really change things for me, it will make the everyday things so much easier. It may sound silly but I will be able to clean our new home like I used to clean. Going for walks, cooking dinner. These are HUGE for me. I love to cook and clean and bake, bizarre I know. The medicine so far is going well, I up my dose Friday and some side affects may occur but they go away in a month. So far just dealing with the flushing. My face and arms get read and itchy but then it subsides. All this a great news. Thanks my dear friend!!! wonderful! hope the changes make life easier, cynthia! Thanks so much Lynn and it will make thing easier!! Oh Cynthia this is awesome news. I love the colorful tennis shoes you got too. You will be stylin in them. This is such great news. It is amazing all the new meds that can help. New mobility and new home for you this year. Woooo Hoooo it is going to be a great year. It made me smile to know you can walk with John and the weiners! LOL I should say dauchs! Enjoy this new freedom. So happy for you. Oh Kris, this made me get all watery, you are so encouraging. This is a huge year for us and it is filled with so much HOPE!!!! To be able to do some of the things that I could do before is an AMAZING thing!!!!! Jess thanks so much, I have to get use to things but the possibilities are finally there!!! Great news for you. I hope the brace continues to help you each day and the pill’s side effects are over quickly. I have a month of maybe or maybe not on the side effects. The brace is helping me a lot just have to my foot used to it! Rosemary thanks so much and finally cute sneakers!!! Thanks Debbie, I can always count on you girls for encouragement and it means a lot!!! That is wonderful news Cynthia!!! I am so happy for you! Anne thanks so much, this is going to be such a change!!! Oh Cynthia, what wonderful news you’ve shared with us. That is so exciting to be on this new drug and in pill form!!! Also, for you to be able to wear cute sneakers will make you feel so much better going out and getting about. Thanks for sharing the happy news. Best of luck on the new drug and stay positive. Pill form is exciting and I’m trying to be positive about side effects. My husband is my anchor and reminds me of that almost every day. I will feel so much better in these warmer months and not feel like I stick out like a sore thumb. What can I say I am a girl and vanity does come into play a bit with fashion. This is such huge news about your new medication and your new brace. I just couldn’t be happier for you, Cynthia! I can’t wait to hear about all the places you walk now, starting with all around your new house! 🙂 Yippee! That is what I am looking forward to Laurel, just doing the simple things like walk around and cleaning our home. We are going to take it one step at a time. I have to get used to it that was the advice given to us from Lou our magician, LOL. Cynthia! This is amazing news! Both the new medication and the brace! I cannot imagine what you have gone through having to do your own injections for so long. But now to have this medicine in pill form is awesome! I’m so excited for you. Thanks Sonya, I don’t know why your comments keep going to spam. I have to get John on top of it, it is driving me crazy. This is very exciting and I just want to get through the first month. I am trying not to worry about side effects but it is hard. No more needles would be the best. This brace for my leg has given us so much hope too with me being able to walk much better it is amazing!!! I am so totally happy for you. Blessings and good health to you!! Loving your new home – and those hardwood floors are amazing. We did chestnut last year and I LOVE LOVE LOVE the color, you will too. Michele thanks so much for your visit and kind words and support. I can’t wait to see t hem stained and I’m glad you like a chestnut color. How wonderful!! I’m so glad that this will help you get around better! Susan this is truly a life changing thing for us. I will be able to go antiquing again and find some treasures. I haven’t been able to do that for six years. Walk with my pups and hubby in our new neighborhood. I can go on for a week. I can only begin to imagine the elation you must be feeling, Cynthia! You must feel like you’ve gotten a new dose of freedom … being able to move around more easily. What a blessing! On another note, your house is looking great and I can’t wait to see when it’s all finished! Oh I am praying that the new med will help you and how wonderful for you to be able to wear your cute sneakers now….So happy for you! Thanks so much Shirley, I will be able to do many things I haven’t been able to do for six years!!!! Oh Cynthia, this is just the BEST NEWS!!! I am so happy for you….I can only imagine just how thrilled you are!!! Your new shoes are so cute too!! Have a great weekend!! Thanks so much Des, we are so happy and excited. This is life changing for us. We went o my dads this past weekend and no cane at all in his condo. yay for you!!!!! I’m so happy for you. I’m glad to know that science has improved for your condition. I hope your new medicine works out for you. The new brace is a great invention too! 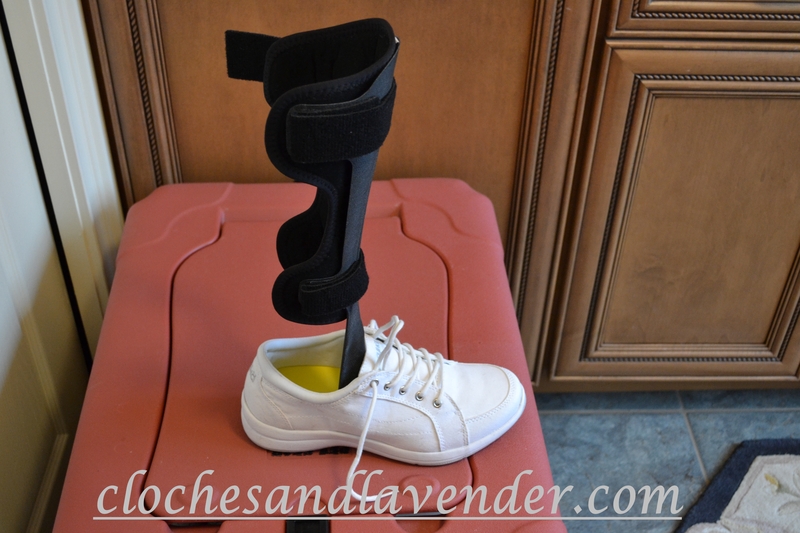 So glad to hear that it will help you walk better and even allow you more freedom to wear stylish shoes again. With all of this and your new house ready soon, I would say that 2014 is a good year for you! That is SUCH great news! I’m so happy for you!!! Thanks so much Manuela, it is so amazing!!! Such great news Cynthia!! We are so tickled for you!! Girls thanks so much for always being here. This is such a HUGE thing for us!!! Thanks so much for your kind words. The brace is amazing. I have been doing well on the new meds and if all goes well only have to inject myself for a couple of months. No needles will be amazing. We don’t think of the things we take for granted – you go girl – you go rock those sneakers on walks with John -( don’t over do it ) just walk nice and slow and enjoy every single second of it ! Suzan thanks so much for stopping by, I know you are incredibly busy with the house. I so appreciate your kind words. It is trued the things we take for granted. I am so excited that this will allow me to clean our new house with no struggles, bake and cook again and do laundry. Weird I know but so true. These day to day task took a lot out of me with my leg. Being able to go to shops and find vintage items again is mind blowing for us. To be able to walk with my dogs, never has happened and now it is reality!!! Cynthia, this is all so wonderful to hear! It sounds absolutely life-changing! Enjoy those cute little sneakers and all the happy places they take you to! BTW – Have I mentioned to you before that my mom had MS? No you haven’t mentioned it to me. Everyone seems to know someone with t his disease. This is life-changing for sure. Thanks so much Amy for stopping by and being so kind! I have been doing really well, a huge difference. At least now I can wear boots in the fall and winter like normal people. This has been life changing so far. Oh Cynthia! Forgive me for not seeing this post! This is such great news for you!! Things that so many people take for granted, like going for walks and being pain free, are issues you have dealt with for too long, but what a trooper you are, and finally there is something that can help you enjoy life to it’s fullest. You go girl! Doreen thanks dear friend for the support. I’m looking forward to the simple things like cleaning the new house, being able to cook again, love it, not mention baking. I never thought that I would be able to walk with our pups and now I can. This truly amazing. I will be able to go back to places I haven’t been in 6 years for bargain and treasure hunting. So HAPPY!!! Triple hooray for you!!!! I am so stoked for you!!! This IS huge!!! You’ll be high-steppin’ it all summer with your newfound freedom!!! Cute colors on the tennies you chose! I’m with you on downright hating those needles, girl! You were brave to just go on and step up to the plate. So glad, though, that the newer drug is in pill form. I don’t like taking pills, either, but it’s a whole lot better than needles!!! Turn on Pharrell Williams’ song “Happy” and just dance the day away with your newly super-fortified legs!!!!!!!! Awww sweetie I’m so happy for you! What wonderful news!! and I love your new shoes too! Thanks so much Anne. What a difference!! !